Gel candles are a somewhat new addition to the craft world, but lots of people who would never make standard candles love to make gels. They're made from a clear, almost rubbery gel-like material that is translucent, allowing you to embed flame-proof objects in the gel and create a cool glow with the use of different colors. There are a couple of different ways to buy gel for making candles. Gel can come in a squeeze bottle, bucket or tube. It may already be colored or it could be clear. For those just starting out, consider purchasing a candle making kit that include the gel, wicks with weights (so the wick will stand on the bottom of the container), color and scent additives. If you prefer not to have to heat up a gel, a candle product in a tube is the way to go. You will simply pick your desired candle container (tempered glass is a good choice because it can withstand the heat of the flame), and place a weighted wick in the container, as close to center as possible. Wrap the wick around a skewer or a pencil to help it stand up straight in the container, and use tape or candle mold sealer to attach the end to the side of the container. Then just squeeze your gel in. Gel in a tube is pre-colored, so you won't have to worry about that step. If you want to embed things in your candle, put an inch or two of gel in the bottom of the container, then place your embeds where you would like them and fill the rest of the container with gel. It's ready to use immediately. If you buy your gel clear and by the bucket, it will require a little more work to finish your candles. This type allows for more creativity. Gel wax can be melted on the stove or with an electric burner or an electric melting pot. You can also melt it in the oven. A large glass measuring cup is the ideal melting device if you're using the oven. Check the gel's package for instructions on the best way to melt the gel. Candle gel needs to be heated to 225 degrees F. Use a candy thermometer to gauge your progress, and remember that gel melts more slowly than paraffin. It could take up to an hour to melt your wax. While the wax is melting, prepare your container. Clear glass is best because you will be able to see all the things you embedded in the candle easily and glass won't melt when the candle burns. When the gel is up to temperature, add fragrance, if desired. Make sure you only use scents that are made for use with gel candles, and don't use more than half an ounce of fragrance for each pound of gel. If you don't want to measure, just use a couple of drops. Then add color. There are liquid color dyes and color blocks available for coloring. Start with a small amount of color, stir in well and consider the color before adding more. If you want to see what the color will look like when the candle is set up, dribble a small amount of gel on a piece of waxed paper and allow it to harden. Additions should be made off the heat so the gel cools a little bit before pouring. If your gel should begin to harden at any point in this process, simply warm it up again. Then just pour, add embeds and allow to cool before using. If you want your embeds to stay at the bottom of the container, put them in before adding any gel to the container. If you want them to "float," add a little bit of wax so they have something to support them. If you want them at the top, you can fill your container almost to the top with gel, then place your embeds and put a small layer of gel on top. There's no wrong way to do this. Just make sure you leave some room for the gel and don't load the container up with too many embeds. Theme candles are great and the possibilities include ideas such as beach scenes, holidays, seasonal candles, color themes, etc. Have fun and see what you can put in a candle that you might never have considered before. This project is fun for people of all ages. 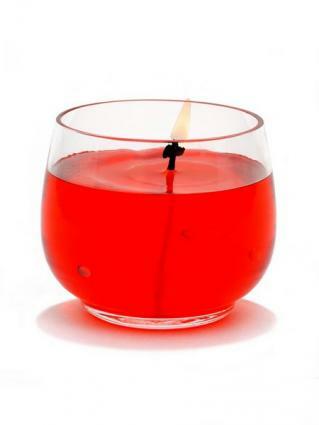 Because gel candles burn longer than paraffin wax candles, some people assume that they don't have to be attended to as carefully as wax candles. The candles still burn, and they can cause fires, particularly if the candle is made in a container that can't hold the heat and the burning candle is left unattended or around small children. Gel candles aren't any more dangerous than regular candles; you just need to remember to use common sense around them like you would anything else on fire. These candles make great gifts, so remember to share these safety precautions with anyone you share your love of candles with.